The 'prison bar' stripes was a bold design and certainly stood out! 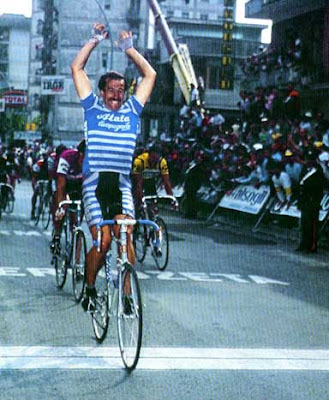 Urs Freuler sprints to his 3rd stage victory in the 1985 Giro. Italian cycling jersey design of the eighties produced cool, distinct jersey's. 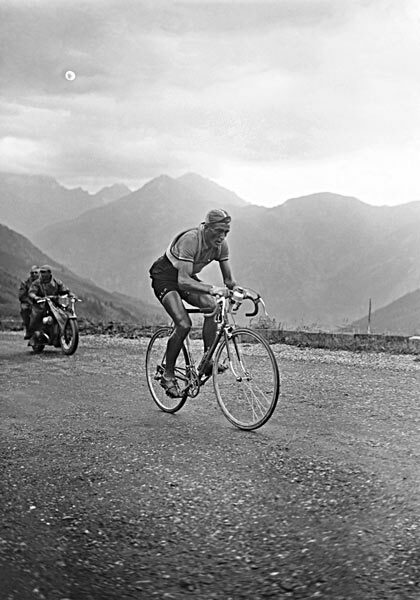 Artisan bicycle builder, Cesare Rizzato of Padova introduced the Atala brand back in 1938. The Atala team was a formidable team and was in the professional ranks from 1982 - 1989. 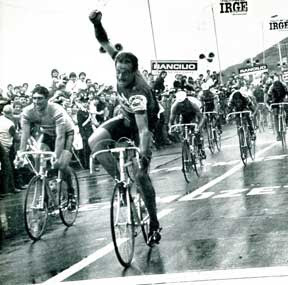 Great rider's were part of the team's illustrious days; Panizza, Gisiger, Bugno, Vitali, Podenzana. As the team was Italian based, the Giro was 'the' race to be part of. One rider that stood out, with his distinctive moustache, was Swiss sprinter Urs Freuler. 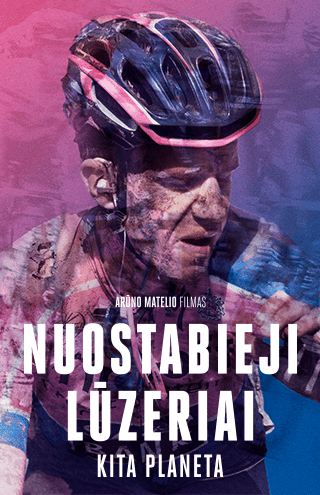 He won 7 world points, 2 keirin titles, and several six-day races, before collecting 15 Giro stages and winning the points classification(purple jersey). With his speed, strength and stamina from road racing and on the winter tracks Freuler was a very tough man to beat in sprints. His career was a long one, turning pro in 1980 and ending in 1997. During his last years he devoted his time riding the winter six-days. Points jersey wins in the rain! The rapid Swiss, Freuler wins his 2nd stage of the 1984 Giro. He'll go on to take a total of 4 stages and win the points classification. That year, Rosola(far left) rides for Bianchi, but comes in 2nd! 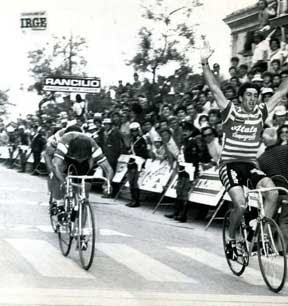 Paolo Rosola(career from 1978-1990) was a fearless road sprinter and superb track specialist. 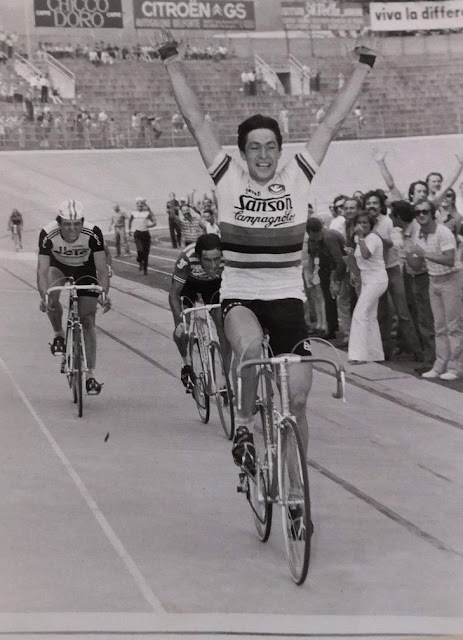 He was 3rd in the 1979 Italian pro track sprint championships. Rosola went on to win a total of 12 Giro stages, 3 with the Atala team. Here are some of my favorite pictures of the two great Atala sprinter's in fine Giro d'Italia fashion! Two Atala's fastmen conferring with their team director. 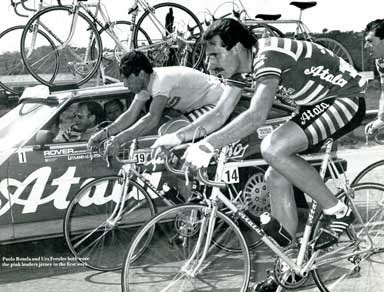 Rosola(left wearing the pink jersey) & Freuler(with his signature moustache) in the 1983 Giro. In the first week Freuler would also wear the pink. The 80's ushered in the shorts with side stripes. A fashion statemate? Definitely! Nice bike & jersey! Giro 1983. Rosola wins stage 3. This is the stage that earns him the pink jersey!